We were contacted by this couple looking to purchase a home in the Kensington area of San Diego and it had a swimming pool. Due to the property being on a hillside they wanted to make sure the pool was safe and in good condition. We first noticed that the pool tile, light and where the equipment was placed that it must have been built in the late 60’s/70’s. 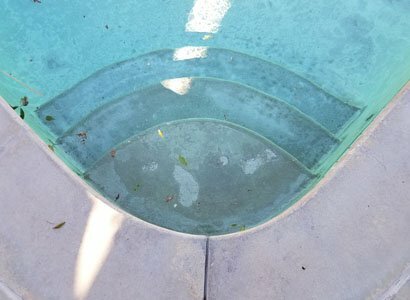 Our first concern was very clear to the eye as we noticed a large amount of pool plaster that has failed. 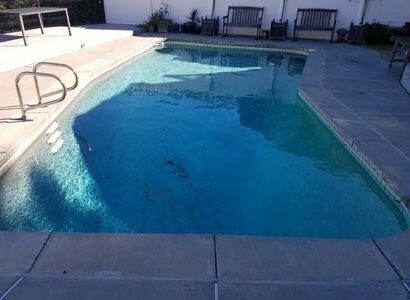 Failing pool plaster is when the smooth surface layer separates from the rougher aggregate causing circular areas of roughness. This problem is caused by multiple issues including the overall age of the pool plaster or, excessive usage of dry chlorine or tablets. Most often, we will see exacerbated levels of plaster damage that directly correlates with the use of a chlorine floater, inline/offline tablet feeder or excessive use of dry chlorines. 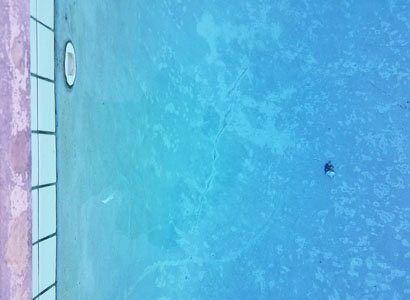 When looking at a swimming pool on a hillside or when the property has a decent drop-off, we do on occasion find abnormal cracking in the pool’s surface. 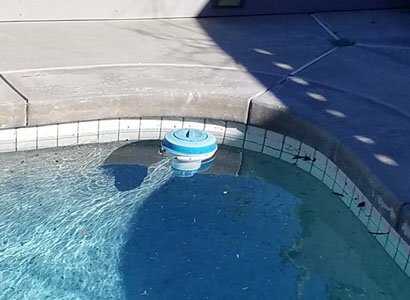 On this specific San Diego pool inspection there was one small structural crack in the pool’s plaster though it did not look to have penetrated the entire plaster’s surface. As we never know exactly what lies underneath the existing pool’s surface we base this on experience and we were not too worried due to it being fairly small and not very wide. Pool lights can last a very long time though this pool light fixture looked to be very old and not what is commonly used today. Along with the age of the pool light, when we tried to turn on the light it was not working. We did not diagnosis the pool light though we believe it is the light fixture and not the electrical. We tested the GFCI and it was fine along with the other pool electrical to the time clock and solar controller was working just fine. 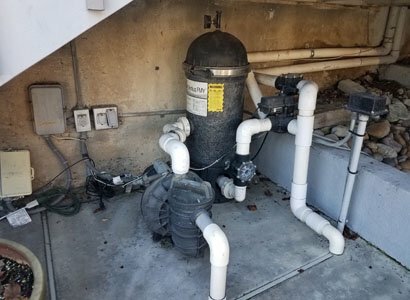 The rest of the pool equipment at this pool inspection that we performed in San Diego near Kensington looked older and the pool filter definitively needed to be replaced. 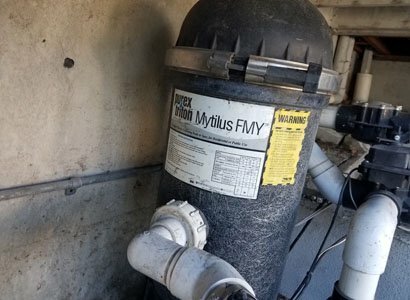 We had a problem when looking at the condition of the old pool filter and figuring out what to explain to them when installing a new pool filter. Spacing underneath their back stairway was only a few feet high and most of the new pool filters are much taller than this space allows. After a little research, we found that it might be best if they install a small sand filter that only has to have the sand changed out every 2-4 years or so. Doing this would allow the pool owner to keep the pool equipment located in the same out of the way area to save space on their deck. Last of all the 3/4hp Sta-Rite MaxiGlass pool pump was older though in fair working condition. Based on what filter they go with and the requirements to get the water up to the roof for the solar panels would determine the next pool pump installation they would go with. Most likely they would want to opt for the new Pentair 2 VST variable speed, energy efficient pool pump. This swimming pool pump would give them the added ability to program various speeds based on the pool’s need to use the solar or to save money on electricity by running at its lowest speed possible. We are a licensed swimming pool contractor that provides swimming pool inspections throughout San Diego County. If you need help with your pool inspection, we are here to help with our knowledge and expertise. My fiancé and I found your services very helpful. We had Kevin complete an inspection on the swimming pool on a home we are in escrow on and hoping to purchase. He was very knowledgeable and able to explain his assessment and findings in terms that were clear and digestible. He was personable, forthcoming and knew his stuff well. When a question came up he did not know the answer to, he was able to access and provide the answer quickly. We were very pleased and will recommend your services to others.